"Nothing I can see but you when you dance, dance, dance; Feeling good, good, creeping up on you so just dance, dance, dance; I can't stop the feeling!" -- is this song familiar to you? You're right, it's by Justin Timberlake, and this is how Magnum Red Velvet makes me feel. All because it aids the summer heat! As many people would know, red velvet is usually made of cocoa mixed with red food flavoring -- and by cocoa, it's essentially very similar to chocolates. I'm honestly not fond of chocolates. But I don't know why, red velvet desserts never fail to make me salivate. Is it because of the color? Or is it the cream cheese that makes the difference? 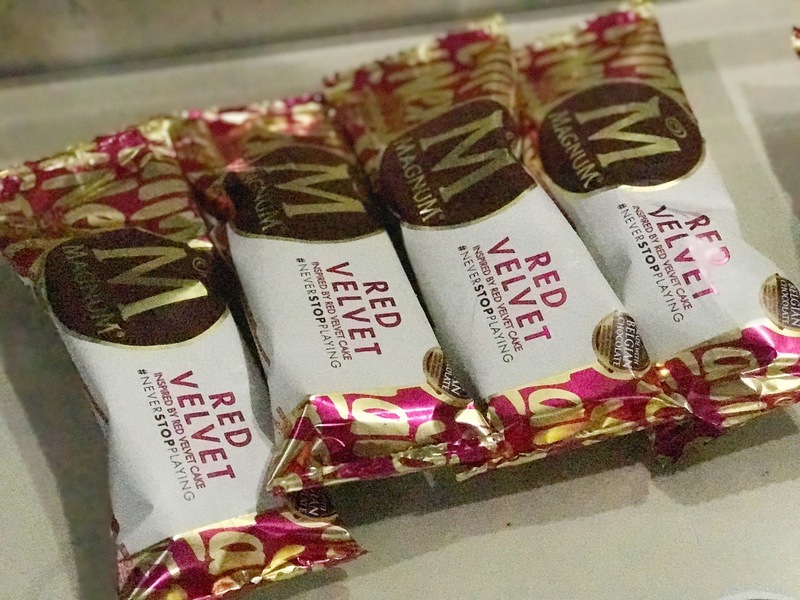 Whatever that may be, Magnum has definitely done a good job with their all-new flavor inspired by the red velvet cake. The new Magnum Red Velvet is one of two flavors under the Magnum White Range. It is crafted with decadent red velvet ice cream, a rich cream cheese flavored swirl, and wrapped in an exclusive white Belgian chocolate with cream cheese flavor. The other variant from this range is the Magnum White Almond, which is the same decadent white chocolate ice cream bar we all know and love, in a fresh new look. Both Magnum White Range flavors are in line with Magnum's #NeverStopPlaying campaign, a sophisticated homage to the life less complicated, a reminder to find fun in everyday life, and a delicious invitation to take a break to enjoy life’s little indulgences. Magnum's way of embodying the #NeverStopPlaying attitude is through fashion and lifestyle. They have partnered with world-renowned bag-maker Aránaz, eyewear curator Sunnies Studios, and noted clothing designer to Manila’s most fashionable set Boom Sason. What better way to jump into the bandwagon than through an online activity, which will allow all of us to win exclusive pieces from the #NeverStopPlaying Fashion Collection starting April 16. Simply head on to www.magnumfliptoplay.com to flip to play using your smartphone. Play as much as you can daily and increase your chances to take home one of 25 Sunnies his and hers #NeverStopPlaying kits, 6 one-of- a-kind Arānaz pieces, and 6 custom-fit Boom Sason designer pieces from the Magnum collection. Magnum White Almond and Magnum Red Velvet are available in all leading supermarkets and convenience stores nationwide.